When I first moved to Cincinnati I lived downtown. Because I was new to town, and they felt downtown was in fairly close proximity an acquaintance asked if I had ever been to Spring Grove Cemetery. Being in my 30's, single, and very much alive I thought it a somewhat odd question. Fast forward a number of years. I'm now married, and have 4 kids and am beginning to do portrait photography. I had a client request Spring Grove Cemetery as a location. I had still never been there, so I took a day to go explore. I spent the entire day hiking through a small portion of this vast cemetery taking photos, and fully understanding why that person had asked if I had been there. Spring Grove was a beautiful place and clearly worthy of being considered a Cincinnati landmark. So, how did this place come to be? In the 1830's and 1840's there was a cholera epidemic. The increased number of deaths highlighted a problem of overcrowding, and in some cases poorly maintained grounds at the local church cemeteries that were available. Spurred by these issues the Cincinnati Horticultural Society formed an association in 1844 to find a location where they could create a new cemetery. Their vision was to have a beautiful, clean location for Cincinnatians to bury their deceased that would serve as a park like setting for the living. Salmon Chase was instrumental in moving this from a vision to a reality. After lobbying legislators a special act was granted on January 21, 1845, and Spring Grove Cemetery was born. The first person was laid to rest on the grounds on September 1, 1845. In 1987 Spring Grove Cemetery became Spring Grove Cemetery & Arboretum to fully reflect its park like atmosphere. Spring Grove covers 733 acres with about 2/3 of that land being landscaped and maintained. If you have not visited this Cincinnati landmark, it's a great place to visit. There are a number of special events through the year like car shows, and 5k walks and even Civil War events (there are a number of Civil War veterans in the cemetery). Use this map to guide you through your adventure (click on the word map). * information for this blog was found in the history information on the Spring Grove web site. A number of years ago we were at a friend’s house and their daughter brought out a box of rocks. Well, fossils actually. Her dad mentioned that there was a nearby park where you could explore an exposed rock hillside for fossils. In fact, that was the whole point of the park. At the time we didn’t have children and we didn’t live in Sharonville. Fast forward 12 years and we now have 4 children, and we happen to live in Sharonville. Until this past weekend, we still had not explored this unique park. My wife was in the middle of a project that really required that the boys be out of the house. We had just gone to the zoo a week or two prior, and it was a beautiful day, so the idea hit me to drive up the road to the fossil park. When you go, it’s not hard to see why people use phrases like ‘hidden gem’ to describe this park. It’s located off Hauck road, which does not look like a park kind of location. There is an entrance halfway between route 42 and Cincinnati-Dayton which looks like an entrance to an industrial park. It looks like that because the park is actually located in an industrial park. After you turn onto the entrance road it’s a short drive and there is sign and parking lot on the right side of the road. When we pulled in, there were a few other cars in the parking lot, and a hillside, with lots of exposed rocks, with a moderately steep elevation, leading up to a bank of trees. It looked like no other park I had been to. I had been in Jordan the prior October, and we had taken a trip along the Dead Sea. To get back ‘home’ to where we were staying our host drove us on a two-track through the mountains. At one point we got out of the SUV and walked around a bit and it was dry rocky soil. This hillside, on a small scale reminded me of that. When I Googled the park prior to our trek there I didn’t run across much more than very basic information. Having gone there here are some things I would suggest to make the visit more enjoyable. Wear shoes with good support. The hillside is a little steep in some spots and you’re walking all over loose rock. Tennis shoes are probably fine if they are not falling apart, but sandals would be a bad choice for this location. You’re going to get dirty. The whole point of this park is to explore the rocks to find fossils. To do this you will be sitting on the ground, digging in the dirt, and getting dusty. Don’t wear your best clothes or anything you’re afraid to get dirty. Bring sturdy gallon baggies or small buckets. You’re allowed to take the fossils you find with you. I had no idea prior to going, and brought nothing except me and my boys. My oldest son figured this out and soon found one of the couple other families that were there and wound up getting them to part with a few baggies (‘thank you’ prepared family for coming to my rescue). The other item that seemed to be a staple in the groups that were prepared to visit this park was some type of rock hammer. My boys ran across another boy of a similar age that was there with his Grandfather and they had rock hammers (which is what drew my boys over to them). When they graciously let my boys share in the use of their hammers we wound up making park ‘buddies’ and hanging out with them. The hammers do serve a practical purpose in that you can split open larger rocks that have coral or shells showing. The split rock sometimes provides even more to look at inside than what you could see on the surface. My boys are 8 and 6 so honestly the hammer was mostly used just to beat on rocks which they found to be incredibly fun. The hillside is sort of steep in some spots, and my youngest did admit to being nervous on the slope a few times. Falls and skinned knees and such I’m sure are pretty common here. The parking definitely seems to be adequate. I did not see a bathroom building, but there are portable toilets on the site as well as what looked like a pretty elaborate hand (fossil?) washing station. There are also a few picnic tables. There is a fair amount of signage which provides information on the park’s origin, as well as explanations of the types of fossils and natural history that can be found on the site. Your kids aren’t going to find T-Rex bones. In fact, the fossils we found were all coral and shells. There are lots of them though, and it really doesn’t take a lot of work to come away with some fossils. While all but the die-hard natural scientists would have a hard time making this park an all day adventure, it’s not the same old park experience you could get anywhere. I can definitely see is making a return visit...but more prepared this time. Everybody seems more carefree and fun-loving in summer. School’s out, the days are longer and there’s more time to get out and enjoy yourself. Back before gas became a financial concern, one summer pastime was to hop in a car with your friends and go cruisin’. Summer in Sharonville, Ohio brings back that cruisin’ tradition, although the cars don’t move. 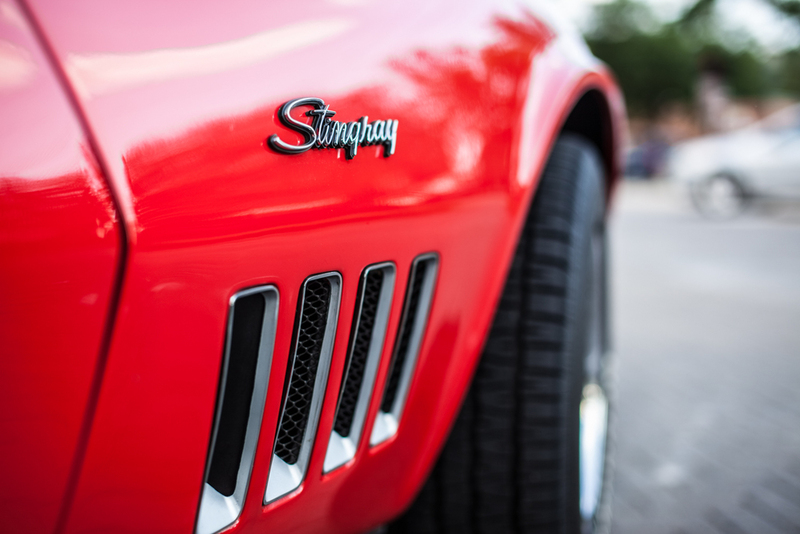 Thursdays this summer, from 6pm to 9pm, classic car lovers come to Depot Square in Sharonville to hang out and check out the ‘wheels’ of those that have come to show off their ‘rides’. It’s an informal, family friendly, free summer activity. There is a DJ providing an oldies soundtrack to the evening. 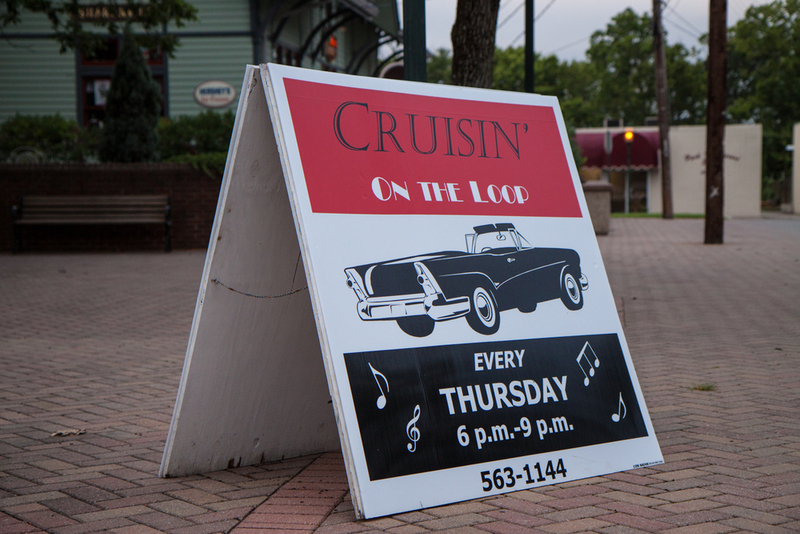 If you’re into cars, and out cruisin’ around looking for something to do on a Thursday this summer, come to Sharonville’s Depot Square and check out the cars that are there ‘Cruisin’ the Loop’. The summer has just officially ended, but here in the Cincinnati area the forecast still has a little bit of summer in store for us this weekend. If you find yourself looking for a way to get out and enjoy that beautiful weather may I suggest a ride down the Ohio River on a Ride the Ducks tour. It's a pretty unique, and fun way to enjoy our beautiful riverfront. Ride the Ducks actually began in Branson, Missouri in 1977. From there, they branched into an agreement with the Boston Duck Tour to provide vehicles. In 2008 the Ducks landed in Newport. Not only is there a cool factor because of the duck vehicle, and the chance to float down the Ohio River, but it's actually a very informative little tour of the business district of Cincinnati. You'll drive through downtown, where you will hear neat trivia about the places you drive past, but you're also encouraged to blow your Duck Horn! The weather may not be this nice again for some time. Treat yourself and head down to Newport on the Levee and hop on a Duck Tour this weekend. It's a really interesting way to see the city! Four score, and seven years ago......famous words, from a famous President, spoken during a time in our history that continues to captivate our imagination. During the summer especially, legions of men and women across the country transport themselves back in time to a place when our states were not quite so united. They wrap themselves in blue, or gray, grab their long rifles, and time warp back to the 1860's. President Abraham Lincoln and President Jefferson Davis and their guards in casual conversation while a lady and her daughter pass by. 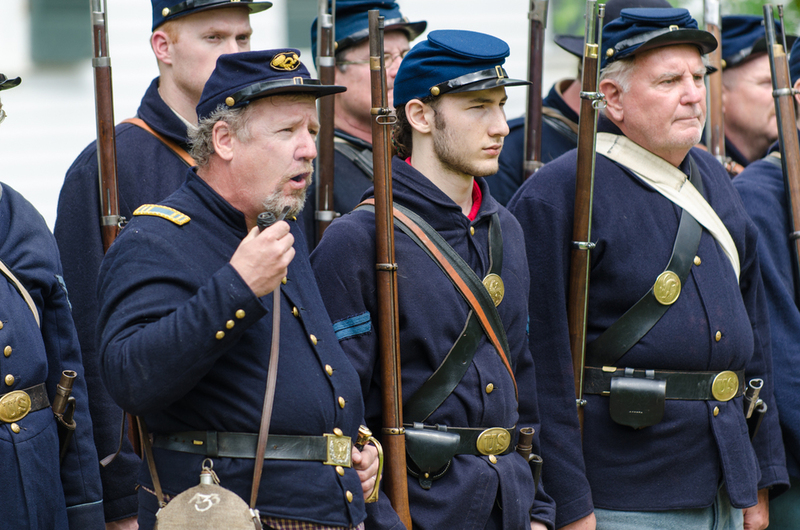 Gettysburg is the most famous of the Civil War reenactments, but these throwbacks in history take place all over the country. In Cincinnati, Sharon Woods plays host to such an event which takes place in it's living history museum, Heritage Village. Heritage Village offers a wonderful backdrop for such an event since it is a recreated 1800's community featuring 13 historic buildings that were saved from destruction and moved to their Heritage Village home. 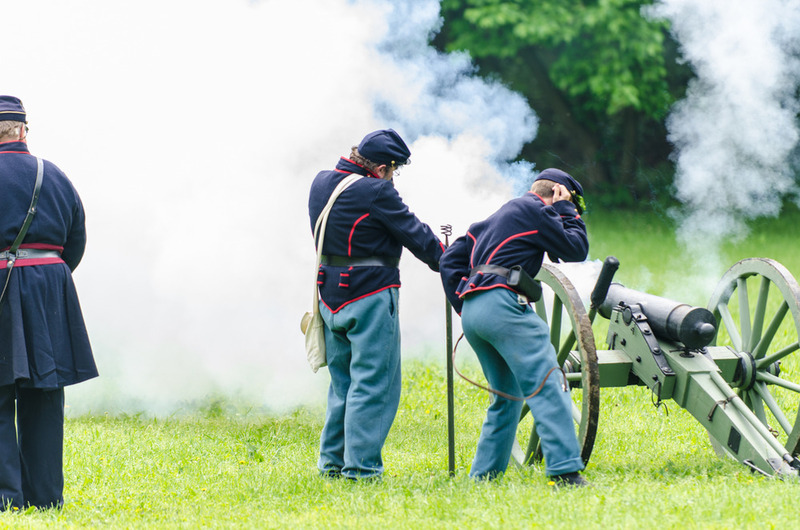 Heritage Village maintains a blog, Instragram and Twitter account, as well Facebook, so it's easy to keep up with events, and check on when the annual Civil War days are taking place. This year's event takes place this weekend, July 12th, and 13th. Cannon fire at the Civil War Reenactment at Heritage Village in Sharon Woods, Sharonville, Ohio. I must admit, prior to last year I had never attended such an event. It seems strange to me that I never had never been because my father is a huge Civil War fan. Book after book filled our shelves when I was growing up on Bull Run, Lincoln, Antietam, etc. Through a few chance circumstances I was asked to come to the event and shoot for the day to get some shots that could be used for the museum calendar. Even the entertainment is dressed in period! These guys gave a musical backdrop to the entire day. I was so excited to finally get a chance to go to a reenactment. We live close enough to the park that yearly I would hear the cannon blasts and think, "man, I should really go check this out". As Joe McNally says, my camera was a passport. I throughly enjoyed spending a day capturing the scenes. There was a personal reason I was excited to get the chance to shoot this event beyond the desire to see a reenactment. A friend of our family was very active in reenactment, and as was the fear, it was his last campaign. In 2014, the Civil War days will have a soldier missing. You will be (are) missed. There are a few landmarks that truly define Cincinnati. One of those landmarks is the John A. Roebling Suspension Bridge linking Covington, KY to Cincinnati, OH. This Cincinnati icon, which is in the National Register of Historic Places and designated as a U.S. National Historic Landmark, was built around the time of the Civil War between 1856 and 1867. As a member of the Misfits With Cameras club I had the opportunity to have a bucket-list adventure by taking a photo expedition to the top of the Kentucky side of the bridge. I have a fear of heights. In fact, this fear was so pronounced that not long before this bridge expedition I was unable to step off a ladder on to the roof of my garden shed to finish doing the roofing work. I chose to ignore that fear, which I kept successfully out of my my mind until we began our ascent up the side of the bridge. I'm about 6'3", and the guard rail on the side of the stairs seemed to come no higher than my hip. About halfway up the fear rushed in, and I stood in frozen terror on that see-through stairway bolted to the side of a Civil War era bridge. Looking down, I saw that at least five more of my fellow photographers were below me coming up the stairs. There was nowhere to go but up, so I took a deep breath and started back up the stairs. Once you reach the top of the stairs you are forced to either climb over the concrete railing, or go through the large holes in the railing. I was too scared to crawl over, because if you mess up, you fall off the bridge. I maneuvered my 6'3" body through a hole just barely big enough to fit me. Did I mention I'm a bit claustrophobic as well. Once I reached the top and was on sure footing I was able to take in the view! It was then I really began to appreciate the unique nature of my vista. The fear of the trip up was now a distant memory. When the first people began to cross the bridge in December of 1866 it was the longest suspension bridge in the world! John A. Roebling had a hand in designing a number of bridges. One of his other well known creations stands as an icon of its city as well - The Brooklyn Bridge. The Brooklyn Bridge cost Roebling his life though. An accident at the beginning of construction led to tetanus which proved fatal. Mr. Roebling never got to see his most famous project completed. Our band of 'misfit' photographers managed to stay up on top of the bridge for about an hour. It was a fantastic experience that I'm so glad I was able to experience. Oh yeah.....and a week later while my family was all out in the back yard I got out the extension ladder and promptly scaled it to the lofty peak of my garden shed!